Chikamasa Scissors are extremely sharp and suitable for a variety of tasks. The scissors blades are fashioned from high carbon tool steel that is chrome plated for rust resistance and easy cleaning. Gardening : suitable for flowers, herbs, twine and pruning. Floral Art : Ideal scissors for the flower arranger softies make light work of soft or hard stems and florist wire. Kitchen : Great for opening all types of packaging as well as cutting meat, fish, poultry and rinds from bacon. Also suitable for : Leather, paper, carpet, tin, card, fabric, electrical wire, lino, string. Softies scissors will cut through just about anything. 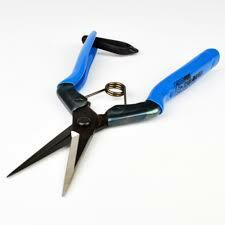 If looked after Chikamasa Scissors scissors will last for years even when subjected to abuse.